Gallery Loupe is proud to present Saturation Point, the first solo exhibition by Israeli artist Naama Bergman ; the show will feature her most recent works. 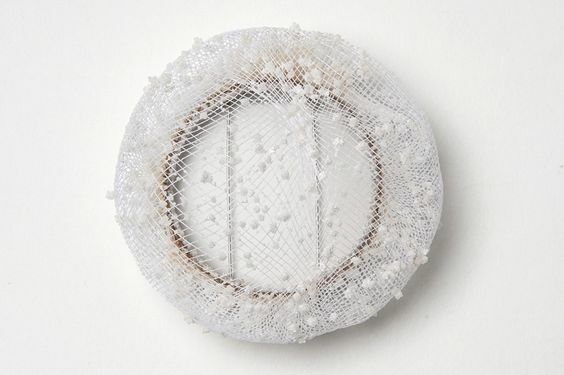 Through inventive, impeccably fabricated jewelry and vessels, Bergman exploits the idea of change: emergence, growth, decay, and the tension that accrues between cultural heritage, physical matter, and fleeting time. By combining contradictory materials such as steel and rust within classic formats like urns and pods, she questions the essence of creation, potential, and transformation; she provokes a confrontation between preservation and decomposition, while at the same time positing questions about the hegemony, function, and mutability of mediums and forms. Bergman makes protean objects that tell a continuing tale about the very nature of existence. Tradition and nostalgia play major roles in Bergman’s aesthetic. As a Sabra of east European heritage, she regards her work as tropes for the dichotomy between familial roots and present day reality. 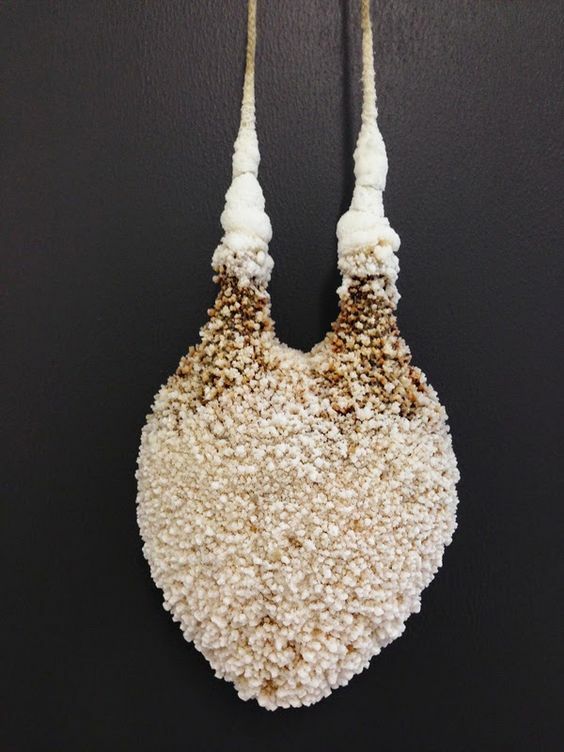 In her latest works, Bergman allows salt to grow slowly upon vessels, pendants, and brooches made from iron mesh. 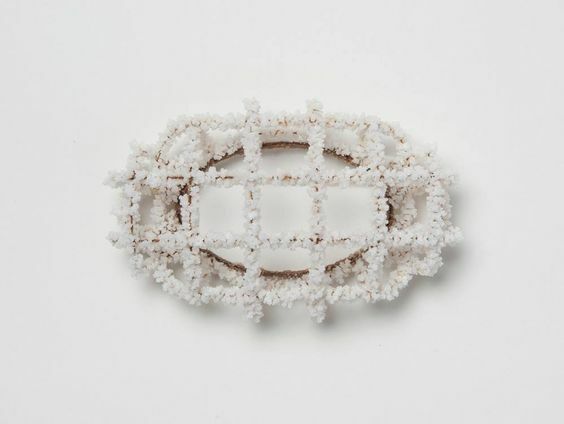 The openwork armatures are hard but delicately crafted, while the salt – a natural preservative – both helps to maintain the rigid support but also breaks it down. Although constantly altering, these pristine objects and jewels are simultaneously frozen in time. 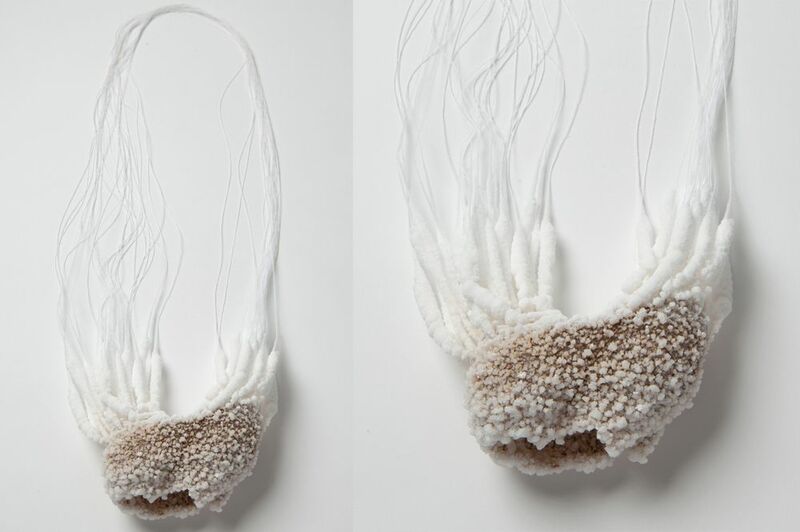 Other works will be presented that possess similar existential and cultural references, although they are made from very different substances, such as jewelry wet-molded into shape from animal intestines that have been treated in a salt solution – meant to be viewed as reminders of their former natural life. Naama Bergman was born and raised in Tel Aviv. 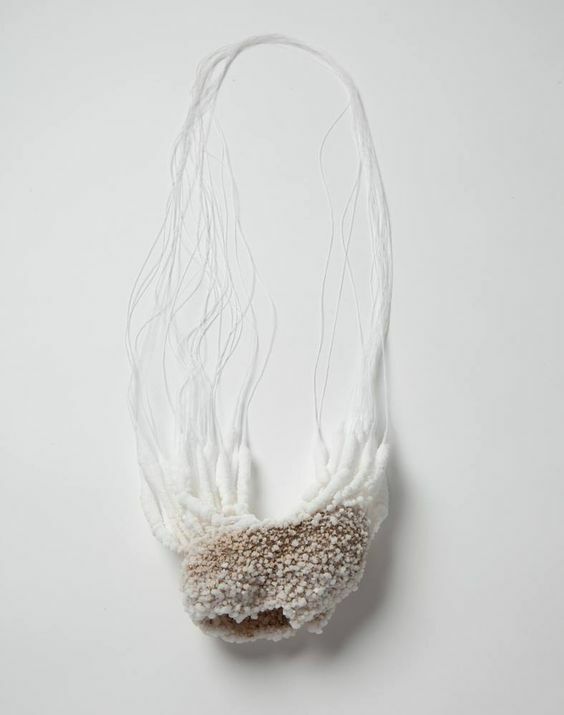 She holds a BFA from the Department of Jewelry and Fashion, Bezalel Academy of Art and Design, Jerusalem. Currently living in Munich, she is pursuing graduate studies in jewelry at the prestigious Academie der Bildenden Künste, with Karen Pontoppidan, having also studied there with Otto Künzli. Bergman is the recipient of several awards, including a 2015 and 2016 Study Scholarship for Foreign Graduates in the Fields of Fine Art, Film, and Design/Visual Communication and Film from DAAD, a German foundation, which supports emerging artists; a 2008 and 2009 scholarship for metal design from the Israel Cultural Foundation in America; the Eithan Ron Prize, an award for excellence in jewelry design, and Irit Strauss Prize, a scholarship for excellence in history and theory, from Bezalel Academy of Art and Design, Jerusalem. 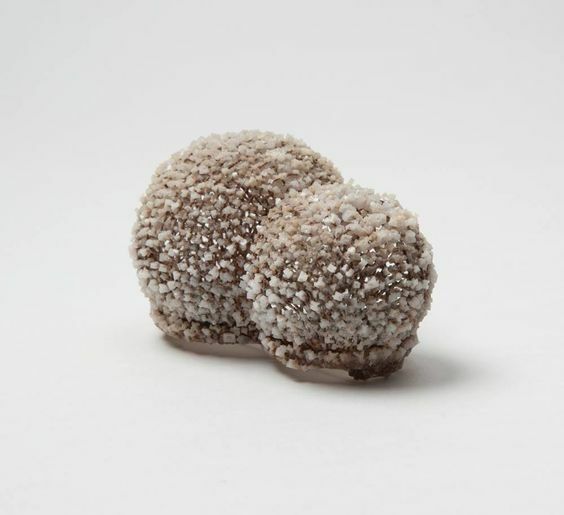 She has been included in exhibitions around Israel and in New York, the Netherlands, Germany, Tokyo, London, and Paris.